If you are short of time, the answers to the following 3 questions should let you know all you need to about the Sonicare DiamondClean Smart electric toothbrush. If we have missed something, let us know in the comments. If you want more detail, you can read our full Sonicare DiamondClean Smart review further down the page or watch our video review. Price is possibly the only thing wrong with this brush. If you have a tight budget this is not for you. But despite the high price tag, what you get is seriously impressive — we have named this as our ‘best brush to buy if money isn’t an issue’ in our toothbrush ratings post. It’s also a great toothbrush for travelling with . Performance and daily use of this brush is fantastic, it really sets the bar high and shows what is possible with neat, innovative touches. We have given a rating of 5/5 to the DiamondClean Smart. The DiamondClean Smart is really in a league of its own. It is the ultimate in electric toothbrushes. It has all you could ask for and a bit more. Made by Sonicare, the Oral-B equivalent is the Genius Pro 8000. For something a bit less feature rich and cheaper, but still of the uppermost quality the Sonicare 6100 ProtectiveClean is worthy of consideration too. But, you might like me realise that actually the premium is probably worth it. 3. Where is the best place to buy the Sonicare DiamondClean Smart? There isn’t a ‘best’ place to buy this toothbrush from and at the time of writing there was good availability from US retailers. Our price comparison table below shows some of the cheapest online stores and it’s always worth checking out eBay, too. If you want the very best and are prepared to pay for it, then this is the brush for you. Go for the top of the line DiamondClean Smart 9700 in Lunar Blue. If it were a car it would have the looks of a Ferrari a Lamborghini. This is the brush I want for use everyday! Sonicare have really followed in the footsteps of Oral-B in producing connected electric toothbrushes. But what they lost out on for being 2nd to market they more than make up for in style, quality and experience here. Right, so Sonicare have not made this easy there are 4 different models of the DiamondClean Smart. 9300 Series – 4 cleaning modes. Clean, White+, Gum Health and Deep Clean+. 9500 Series – 5 cleaning modes. Clean, White+, Gum Health, Deep Clean+ and Tongue Care. 9700 Series – 5 cleaning modes. Clean, White+, Gum Health, Deep Clean+ and Tongue Care. 9750 Series – 5 cleaning modes. Clean, White+, Gum Health, Deep Clean+ and Tongue Care. 9300 Series – 4 color options. White, Black, Pink and Silver (some call it Grey). 9500 Series – 5 color options. White, Black, Pink, Rose Gold and Silver (some call it Grey). 9700 Series – 1 color option. Lunar Blue. 9750 Series – 1 color option. Lunar Blue. Finally, as a result of the different cleaning modes they have slightly different box contents. Just to add slightly more confusion, as of June 2018, there is a new variant of the 9700, the 9750. Model number HX9954/56, it has all the same features of the 9700 and is Lunar Blue in color, but the box contents is different. It comes with 4 brush heads (of each) instead of 8, but comes with a brush head storage unit that has not previously been offered with the 9700. So those are the different models and what sets them apart from each other. I do hope that makes sense and answers the question ‘What is the difference between the Sonicare DiamondClean Smart 9300, 9500 and 9700 Series?’. Aside from these differences the brushes share all the other same features and benefits. In this review we are taking a closer look at the Sonicare DiamondClean Smart 9500. Please note: In this review we are taking a closer look at the Sonicare DiamondClean Smart 9500. The box contents does vary for other models as explained in the ‘Variants’ section of this review. Here are what I consider to be the main plus and minus points for the Sonicare DiamondClean Smart series. Quality – The brush and the package feels and looks great. It is premium from every angle. Bluetooth connectivity – The app and the connectivity is well thought out and performs extremely well. 4/5 cleaning modes – Subject to the model there are up to 5 cleaning modes available. All are excellent, engineered to help you achieve the best oral health you can. Battery life – An impressive 3 weeks of battery life is available from the fully charged Lithium-Ion battery and it is simple and easy to charge. Automatic power off – It is a very simple, yet effective means of conserving battery power that psychologically saves more effort than you think. Brush head detection – Not a feature you need, but so useful and just makes for a fantastic overall experience. Intensity settings – Control the power delivered by the brush motor. Pressure sensor – The first Sonicare to offer a visible pressure sensor. Price – It is one of, if not the most expensive electric toothbrush. It will be out of budget for many. Brush head storage – No storage compartment or stand for the additional brush heads included in the box. Smartphone stand or holder – Considering this is a connected brush you are not encouraged to get your smartphone out and really use the app. The Smart offers a lot of features, so this review is quite lengthy and this section probably the biggest, but you will know all there is to know by the end of it. If you have a question or think we have missed something, let me know in the comments. First things first, let me talk about the design of the brush, how it looks, how it feels. Smart and stylish this brush most certainly is. It is clearly part of the DiamondClean range with the aesthetics that are present here, there is a continuity. Now, depending on the model you opt for depends on the color. The 9300 comes in 4 different color options, Black, Pink, White and Silver, with the 9500 also available in Rose Gold. This color relates to the brush handle. The detachable brush heads made by Sonicare are available in White or Black color too. With the White or Pink handle, you get White colored brush heads, whilst with the Silver or Black handle you get Black colored brush heads to match. The most premium DiamondClean Smart 9700 Series comes in one color only, Lunar Blue. The brush heads provided with this handle are Black in color. I personally really like the Lunar Blue but the Black and Grey are nice too. In fact they are all very smart! Continuing the color theme, the provided travel case changes too. The Lunar Blue, Black and Silver come with a Black case, whilst the Pink and White come with a White colored case. The brush handle itself has a smooth premium finish to it. Just like the DiamondClean (non smart version) if you have ever seen or used that. It is hard to explain what it actually feels like. It is not like a glossy hard plastic. Of course it is a solid construction but it feels more premium than most other brushes. On the front of the brush handle on towards the top is the Philips Sonicare logo in a muted gold color. Below this (about two thirds of the way up the handle) is the main power button. It is of a concave design and the thumb sits comfortably into it. There is a large power icon on it. It is not as resistive as some power buttons or does not give the same level of feedback, but you can of course tell when you have turned the brush on or off. Below this button are 3 lights, that increase in size left to right. It looks a little like a phone signal might on your smartphone screen. Each light represents the intensity setting of the brush. If 1 light is lit, the brush is set to the lowest intensity. This is referred to as ‘Low’. 2 lights lit and the intensity is now at ‘Medium’, and if all 3 lights are lit, that is the ‘High’ setting which will give the full power of the brush (subject to cleaning mode). Below this sits another concave button. This is the mode/intensity button. You press this to change between the 5 cleaning modes or change those 3 levels of brushing intensity. The modes can be changed when the brush is switched off, whilst the intensity can be changed when the brush is switched on. Towards the bottom of the handle, the names of the available cleaning modes are built into the handle. Each one lights up when selected. They do not all light up at the same time. The light that shines out from these cleaning modes and the brushing intensity icons is a white light. Below this is the brush head replacement reminder and the battery icon. The brush head icon is one of the most innovative features of this brush and what makes it smart whilst setting it apart from the rest of the electric toothbrushes on the market. It will illuminate and pulse when it is time to change the brush head for a new one (normally at 3 months). It is an excellent extra visual reminder over and above the fading indicator bristles found on the brush head itself. This works in conjunction with the smart chip built into the brush head to know when to remind you. It doesn’t just log when you first attached the head, it actually knows how long each head has spent brushing! At the base of the brush is the LED light ring or the pressure sensor indicator. I will explain this in a bit more detail later in the review. But when activated it lights up a nice purple color and addresses what I have felt to be one of the bigger failing in previous models. The remainder of the rounded square handle is smooth to the touch with no additional icons, grips or features to speak of. I would really like a bit more grip on the handle, be that rubber or raised contours to the back of the handle. Many other brushes offer this. I understand why Sonicare have omitted this and to be fair the brush is not super slippy in hand. Right at the top of the brush handle, just under where the brush head connects is a ring. On the most models it’s a dark grey/black color but on the Blue model it is gold. It contrasts the brush handle slightly. The primary reason we buy an electric toothbrush is to clean our teeth and and the Sonicare does a fantastic job of this. Delivering up to 31,000 strokes per minute the bristles of the brush head skim across the tooth surface and along the gumline to sweep away plaque, bacteria and debris. It is according to Sonicare able to remove up to 10x more plaque and give you healthier gums in just 2 weeks compared to a manual toothbrush. Studies have suggested that Oral-B’s oscillating, rotating and pulsating heads offer better overall cleaning performance. But there is too plenty of supporting evidence to show how Sonicare does an equally good job. As good as the Sonicare clean is, my personal preference is for Oral-B. I actually find the clean a it more aggressive and a bit rougher, which I like. It is clinical debate over which is better. Ultimately, both provide significant improvement over a manual brush. On the other hand, the Sonicare is quieter, producing a humming sound when in use whereas the Oral-B models have a much louder mechanical sound to them when running. Brushing the teeth is not possible without the brush heads. These come included in the box. There are 4 styles of brush head included with the DiamondClean Smart. All new brush heads, these are not quite like the brush heads you may already know and used. They have been scientifically engineered with the bristles to be the right length and angle, they are available in Black or White color options to compliment the brush handle, but the brush heads themselves are smart. Built into every brush head is a little chip. When connected to the DiamondClean Smart brush handle (no other) the brush will automatically be set to the most appropriate cleaning mode for that brush head. The chip and the brush handle communicate to trigger this action. The heads also know how often and for how long they have been used. It lasts for 2 minutes and is designed to to be used with intensity level 3. It gives a thorough and complete clean. It is recommended that you use the Premium Plaque Defense brush head with this mode. This is the mode most will use on a daily basis. It lasts for 2 minutes and 40 seconds and is designed to be used with intensity level 3. The best brush head to use is the Premium White brush head. It lasts for 3 minutes and 20 seconds and is designed to be used with with intensity level 3. The best brush head to use is the Premium Gum Care brush head. The amount of time DeepClean+ runs for depends on whether or not the handle is connected to the app. In connected mode DeepClean+ runs for 2 minutes and provides BrushPacer feedback every 20 seconds. In non-connected mode DeepClean+ runs for three minutes and provides BrushPacer feedback every 30 seconds. It lasts for just 20 seconds and is to be used with intensity level 1 and the Tongue Care+ brush head. You may wish to consult the instruction book that comes with the brush for a step by step guide on how to make best use of each of these modes. We also cover them in detail here. Now, when considering these modes with the Smart brush heads, if you were to fit the Tongue Care brush head and the brush will know to operate the Tongue Care mode, selecting it for you. Replace with the Plaque Control brush head and the brush will change to the Clean mode. It might be a super lazy approach, but in the age of modern convenience why not?! It is a neat touch and something we have thought brushes available today should be able to do. You can manually change what mode is used with each brush head and what intensity setting you want set. The brush heads will work on any mode at any intensity, but the brush is clever enough to know and preset some settings for you for the ‘ideal’ clean and performance. To change the cleaning mode used, whilst the brush is off, press the mode/intensity button the correct number of times until the desired mode is selected. When the brush is powered on that button can be used to change the intensity of the brush. The cleaning mode can be changed only when the brush is powered off. The brush will remember the last cleaning mode used, if the brush automatically powers off at the end of the cleaning cycle. So, if clean was the last mode used and the brush turned itself off, it will launch into this when powered on, if the brush head has not been changed. As I suggested earlier, these heads go one stage further and work in conjunction with the brush to light up a brush head reminder icon (when appropriate) to give you a visual clue it is time to replace the brush head. It knows how long each head has been used for because of the chip. So if you were to use the same brush head every day for 3 month’s the icon would light up around the 3 month period. If you have only used that head 3 times in 3 months it will not light up until you have had 3 month’s use from the head. All Sonicare brush heads (with exception of tongue clean) have reminder bristles that are the blue in color, which over a typical 3 month period will fade from a relatively strong blue to white color. If they turn white, replace the head. This is another visual clue, if the flashing light on the handle doesn’t do it for you. You can tell if it is a smart brush head by the icon towards the bottom of the brush head, it looks like a WiFi logo. New technology comes at a price unfortunately. A pack of 2 heads has a retail price of $30 whilst a pack of 4 has a price of $50. This gives an average cost per head between $12.5-15 each. Thankfully retailers are knocking the prices a bit and if you buy a 4 pack you can get the average cost per head down to about $10 each. Compare this to a non-smart brush head and there is an extra charge of about $2 per head. Smart brush heads like these provided will also not offer any smart functionality on any other brush other than the DiamondClean Smart unless Sonicare develop another brush with the same technology. Built into the handle is the battery, motor and all the other clever tech. The battery is not user removable and is a Lithium-Ion battery for those who are interested. It lasts for a minimum of 2 weeks, but can last for a lot longer (over 3 weeks), subject to the cleaning mode used. Sonicare brushes produce some of longest performing batteries in the market. One way in which they conserve power is by having the brush automatically turn off at the end of each cleaning cycle. You need not turn the brush off, it does it itself at the end of the clean. It conserves power and is another example of a small but useful convenience and is the best way I can think of to tell you that the clean is over. This functionality ties in with the built in timer that is in the brush. At normally 30 second intervals (subject to cleaning mode) you get a notification via a beep, a pause in the motor and brush head motion. This is to signal that it is time to change quadrant and focus on cleaning the next section of the mouth. These timings are all based on professional recommendations and most modes last for 2 minutes. As important as the brush is the way in which you clean your teeth. Sonicare go to quite some detail in the manual about how to clean your teeth, so pay attention. The technique is different for an electric toothbrush to a manual one. This brush is water resistant. You can rinse it under the tap and it will survive a life in a bathroom. Sonicare do not advise use in the shower and you should not submerge the brush in water. One feature that I believes helps a lot with achieving a good habit is the pressure sensor. A feature that has for a long time been on Oral-B brushes but has never really been present on Sonicare models. Built into the handle when the sensor detects when too much pressure is applied to the teeth it reduces the speed of the brush motor and the light ring on the bottom of the brush emits a purple light. It will remain purple until such time as the pressure is released. The bristles need only skim the teeth. Too much pressure can be damaging and lead to gum recession. There is a bit of a false myth that electric toothbrushes cause recession. They do not. If anything they are better for recession! If you use the smartphone app it will show on screen too that you are brushing too hard and need to relive some of the force. As pretty as the light is, you do not want it to come on. Don’t worry though if it does, just know how to solve the issue. Some might argue the purple light is a bit of a feminine color. There is no option to change it. It’s not my favourite color, but I don’t dislike it and it is noticeable ,that is the main idea. I like the principle of how it is implemented, it looks smart without detracting from the design. However, unless in a darker room the light is actually not that obvious. You may see it if brushing in front of a mirror, but I think Oral-B’s neck placement is more obvious, not to mention brighter. It would be nice if there were some of the customisation options like there is with the Oral-B Genius Pro 8000 LED Smart Ring. Another novel piece of tech built into the Smart handle, is something present on cheaper Sonicare brushes too. It is called Easy-start. It is an option that gently increases the power over the first 14 brushings to help you get used to the brushing with the electric toothbrush and is really designed for those moving to the brush from a manual one, where the extra power may seem too much. The Easystart feature works in all modes other than TongueCare+ mode. The brush comes with the mode deactivated, but it can be turned on. Refer to our FAQ’s for details on this process. Part of what makes the DiamondClean Smart unique and indeed Smart is the Bluetooth connectivity and the application that is available for Android and iOS. The ethos is education. Encouraging and advising to clean better. The app is not geared to offer up a lecture on what’s right and wrong, but tips and diagrams to show you how to be better and improve over time. Paying attention to what the app says will help your oral health and could in time decrease your dental bills because you are taking better care of your mouth. Think of it a bit like having a friendly dentist on hand as you brush. Instead it is sensors in the brush handle and a clever app that work in real time. Initial setup is smooth and painless with nice on screen instructions on how to get started. The app is well designed and thought out. It works reasonably well and I did not experience any crashing or stalling in the app. I can’t help but compare the Sonicare app to that of Oral-B’s for their connected toothbrush, there is a lot of similarity. Overall I prefer the Sonicare app experience to Oral-B. Oral-B has improved, but the implementation of using the smartphone camera for enhanced tracking with the Genius whilst novel and to be commended, is just not practical. Sonicare win for simplicity. There are actually a lot of parts to the app itself. Take a good look at some of the screenshots included in this review as this will often give more information than I can just from writing about it. To actually begin logging the clean and see your progress on screen you need to launch the app before you begin your clean. Turning the brush on and having your phone close by is not enough. Sensors built into the brush handle help determine the location of the brush within your mouth and when following a particular cleaning pattern, outlined on screen the two work hand in hand for detailed feedback and tracking. You do not have to have your paired smartphone to hand all the time. The brush will store up to 28 cleans worth of data and sync that next time the brush handle and phone connect, but for the best experience try to use the two together. When using the app and brush together you do not need to be actually looking at your phone the whole time, but it is good to glance at it occasionally. For me this is one of the biggest oversights made by Philips. There is no smartphone holder included. A basic cradle that would hold the phone at a nice viewing angle would have been a nice touch, to keep your hand free and the phone safe. It need not have been a bulky suction cup affair as per the Oral-B Genius Pro 8000. It would cost just a few pounds to include and finish the package nicely. Sadly instead, you will either need to hold the phone in hand to see what’s going on in the app and track your performance, or fashion your own stand. When in the app and following the correct cleaning process you get an on screen visualisation of your mouth along with a timer to easily track where the brush should be and for how long. Brush too hard and an on-screen notification says to reduce pressure. The app also has, reminders for flossing and rinsing with mouthwash and more. These prompts can be turned on or off, but if kept on it will log your responses and keep track of these details too. At the end of any clean you get a visualisation of your clean with areas for improvement highlighted along with details on how long you cleaned for etc. At any time you can go back and see how well you did via the calendar logs in place. Additional elements to the app include the battery status; still a bar and not a percentage (%). Goals allow you to achieve certain targets such as gum health and whitening, you have some pre-set but can create your own. You can get more granular setting focus areas that will focus you on spending more time on certain areas of the mouth. Keep track of dental appointments and even stroe progress reports. Shop for products and subscribe to services like replacement brush head deliveries, gaining a discount within the app. You can enter details about yourself that helps the app configure things for you, earn points by achieving goals as well as tips. In an ideal world we would like to see the ability for more people to share a brush handle between users (changing the brush head of course) to get more value from it. Whilst possible, sadly the Bluetooth connectivity option becomes redundant. This brush can pair with multiple phones but is only capable of logging one set of data. There is no way to differentiate between users. The handles see’s any brushing session as that of the main user. Thus sharing the DiamondClean Smart handle will defeat the very point of the brush. I am sure in time there will be a solution to this, but presently there is not. The only option is to buy another brush. A great experience overall. Some may find it overkill. Sometimes I think this. Do I want or need such? It is clever, but you do need to forma bit of a habit. For some it could become obsessive to log everything completely. If you have any question over the value of the app and think it is a bit of a gimmick, the DiamondClean Smart is not really for you, go look at the DiamondClean. Depending on the variant you go for will depend slightly on the box contents. All have a premium travel case, the difference being the 9500 Series I am reviewing here and the 9700 allow for the brush to be charged in the case. This is not possible with the 9300. Without doubt the best travel case I have experienced to date for a toothbrush, the hard case is finished in a soft touch leather. Robust, it will certainly take some knocks and can hold the handle and up to 2 brush heads. A magnetic closure keeps the lid shut, not fiddly clasps or buttons, but easy enough to open too. It looks and feels every part as premium as the brush. A charging cable (which is 60cm in length) is actually built into the case and tucks away underneath it. On the standard DiamondClean it is a detachable cable, that could easily be lost. On the underside of the case, you remove a large panel to reveal the cable neatly nestled within the case. With one end firmly wired into the case, at the other end is a standard USB Type A connection that can be connected to a USB port on a computer, on a wall charger, to a battery bank and more, to charge the brush where you like whilst in the case. I love this, despite the fact you need not charge the brush all that often with a 3 week battery life. The cover that hides the cable has been cleverly designed and can actually be refitted whilst allowing the cable to be fed out through the back. Given the price, including a USB power adapter for a mains connection would have been a nice touch. With all models you get the charging glass. Think of a glass tumbler you might have a drink of spirits like Whiskey from. Put the Sonicare logo on the front of it and sit it on a plate that has a power connector attached to it and you get the idea. Lent in the glass, the brush does not stand upright. The power connector is a 100-240v and connects to the US mains power outlet. The good news here is that it supports international voltages if travelling, all you may need is a plug adapter. But then again you may just use the charging case? Another complete oversight in my opinion is not providing a brush head storage compartment. As a minimum the DiamondClean Smart comes with 3 brush heads, but with the 9700 it comes with 8. There is nothing to store these in. For years Oral-B have provided a basic brush head storage compartment that held those you used regularly within close reach. But the DiamondClean does not benefit from such. 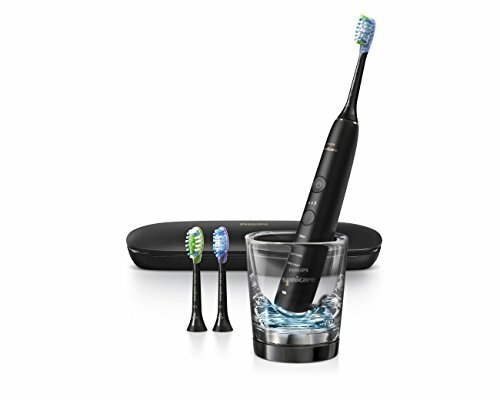 Sonicare do make a stand, it holds up to 3 brush heads upright inside a stylish glass container. It protects them from dust and debris and makes access to them easy. This is offered with the DiamondClean Smart in other countries, just not in the USA. I do not understand why. For the price paid it should have been included with the 9700. Finally for this section, for added peace of mind the DiamondClean Smart comes with a 2 year warranty which covers any brush faults that are not as a result of user damage. You can extend this by a further 6 months if the brush is registered online, these is no cost to this. The suggested battery life on the Sonicare website and marketing materials for the DiamondClean Smart is just 2 weeks/14 days. However, the reality is that like many of Sonicare’s cheaper brushes, it is much better than this. In my hands on testing, I managed some 50 cleaning sessions on the standard ‘Clean’ mode with the intensity set to high. That’s 100 minutes of usage time or 25 days. 11 days more than the quoted 14. However, the Gum Health cleaning mode lasts just under twice as long as the standard clean mode, thus reducing the battery life to just 14 days/2 weeks. This then is why Sonicare claim 2 weeks battery life. You only get this is using Gum Health mode. Whilst Sonicare are actually quoting the worst battery life you might get from the brush, I think they are underselling themselves a bit here as most other brands always quote the maximum possible rather than the minimum. Unless you decide to always use the longest cleaning sessions you will get anywhere between 14-25 days usage out of this brush. Of course should you be draining the power quickly you have two options to recharge the brush. These are via the charging glass provided or the USB travel case (USB travel case not provided with the 9300 Series). The charging glass may sound strange but that is what it is. Like a small tumbler you might have a stiff drink from, the Sonicare branded glass sits on a plate, which in turn connects to the mains power supply. It supports 100-240v. The brush sits in the glass at an angle, not upright like most others and uses the wonder that is inductive charging to replenish the internal battery. Innovative is the travel case, it is an accessory that is included with the DiamondClean, but with the Smart model we have here, an improvement has been made that rather than a detachable USB cable as before, this is now built in. At the other end of the cable is a full sized USB Type A connector. When not in use this tucks away under the case. With the brush handle in the case you can now charge it but connecting the charging travel case to a laptop, a wall-mounted USB socket or a suitable wall adapter. There is no battery in the travel case itself. It takes at least 24 hours to fully charge your Philips Sonicare. This charging time is longer than most other brushes, but then the battery life is quite a bit longer. You do not have to fully charge your handle before first use, as the handle is pre-charged for first use. However, it is recommended to fully charge it after first use. The charging indicator on the brush handle flashes white until the DiamondClean Smart toothbrush is fully charged. When the battery power is getting low, approximately 10% or less, the battery indicator lights up an amber/yellow color rather than white. When the battery is completely flat the brush will beep 6 times and will not power on. Built into the handle the battery uses Lithium-Ion technology and is not user removable. It would be a nice touch if the brush reported an actual battery percentage (%) into the app, but sadly it does not. Only high, medium or low. If you would like to see buying options, we have included a live price comparison here. Let me be clear from the outset, this brush is not cheap. It does not really represent the best value electric toothbrush available today. $50 will buy a capable electric toothbrush, so why spend $150-300 more? Part of the price is for the extra features and box contents, another part is for the innovation it brings. The DiamondClean Smart appeals to those who want the very best. Of course ultimately, value and price is personal, and what I deem good value or expensive you may not. So it is therefore important that you weigh up the information presented in front of you and make your own decision. The good news is that Sonicare have produced 3 different models that come in at 3 different price points. With a recommended retail price of $229.99 the 9300 Series is the cheapest, the 9500 at $269.99 is in my eyes the best buy whilst the 9700 Series at $369.99 is for those who want the ultimate. Whilst there is the recommended selling price, the very competitive commercial world we live in means the prices are often a bit cheaper than what the manufacturers suggest. Of course prices are always changing, but quite often electric toothbrushes are discounted by 20%. The 9300 can typically be purchased for $199 whilst the 9500 is available for $210. For the extra $10 you get the extra cleaning mode, brush head and a USB charging case, which is well worth it. The 9700 is discounted, but the best price I could find was $295. For this you do get an extra 4 brush heads and a limited edition color, but despite my personal love for the Lunar Blue color I find this model a much harder purchase to justify. Setting a new bar in electric tootbrush pricing, even on the best day the DiamondClean Smart is still $50 more expensive than Oral-B’s flagship the Genius Pro 8000. Does it offer more? Yes it does. However, for some this extra spend might be more difficult to justify. If you want an excellent brush with loads of features but want to save a bit of money, the Genius Pro 8000 could well be the ideal mid-ground. The DiamondClean Smart ideally uses the new ‘Smart’ brush heads that have the microchips built in. Such technological advances does mean a price increase. Admittedly not smart, but an Oral-B brush head costs just $5. To allow for comparison, here at Electric Teeth we try and price the brushes over a 3 year period to work out the cost of ownership. An electric toothbrush on average will last 3-5 years, but many do last longer. So, using the 9500 Series, the cost over 3 years is at a minimum $320 or $0.29 per day to own. The Oral-B Genius Pro 8000 comes in at the time of writing at $205 or $0.19 per day. These prices exclude the cost of water, toothpaste and electric to charge it, but you get a rough idea. This price is high and features for dollar spent, there are better buys; but if you want or like the best and are relatively comfortable to spend in excess of $150 you will not regret this purchase. To make things a bit easier on the wallet, I would say you could extend the value of this brush by sharing with others, which you can. BUT there is a massive caveat in that the tracking only works for one user. Given that so much of this brush is geared around the smart tracking facilities it defeats the point. It is not for me to tell you how to spend your money. Like the Sonicare DiamondClean Smart and can justify the price, go for it. For your own sake, shop around or consider if this is really the brush for you, but I don’t think you will be disappointed. If you have ever come into contact with Philips products before, I suspect you have a pretty high regard for them. Most people I speak to do consider Philips to be a premium brand where although their products are a little bit more expensive, you can very quickly understand why. Their toothbrush brand Sonicare continues such traits. Even the cheapest models Sonicare produce punch above their price point and show what is possible. It is no surprise that many are so loyal to the brand. The DiamondClean Smart is very well constructed. The materials are premium and the finish super. Here at Electric Teeth we test the electric toothbrushes in a way that you would use it at home. Whilst the odd knock or tumble may occur we are not putting the brush through extensive durability or stress tests. We have tested every toothbrush we write about, because that is the only way we can be so honest and direct about the points we make. To date I have not experienced any issues with the brush and see few weaknesses. The biggest weakness is likely the user, you or I actually making full use of what is on offer here. Should the worst happen and the brush fail, then it is backed by a 2 year warranty. Do be aware that the Sonicare DiamondClean Smart is water resistant so it can get wet and be wiped down with water but it is not waterproof so where possible avoid prolonged exposure to water to avoid doing damage. Philips explicitly state in the user manual that it should not be used in the shower or bath. Perhaps more caution than anything, but best not test it! If there is such a thing as perfect, the DiamondClean Smart is the closest thing to it in the electric toothbrush world. This is the best toothbrush I have ever used. A bit more grip on the handle would have been good as would a stand or holder for a smartphone. Even better would have been a a brush head storage unit, particularly with the most premium 9700 Series. Omitting such does help keep the cost down, but it seems such an oversight when the price is already as high as it is. The most expensive Sonicare model available and at least $50 more expensive than Oral-B’s flagship brush you will consider carefully whether this is for you. Part of this price is innovation, but another part is for the superb quality and neat implementation of features that just work. Battery life is right up there, the clean is excellent and travellers are covered with the quality travel case. The different models does complicate the purchase decision, but also offers a quality option at different budgets. The 9300 is the cheapest but the 9500 is worth the extra spend to get the USB charging case. Well done Sonicare, this is an electric toothbrush I want everyone I know to own. With Amazon Dash Replenishment, you can setup automatic deliveries so you never run out of brush heads again. Is the Sonicare DiamondClean Smart an oscillating brush? How many brushing modes does the Sonicare DiamondClean Smart have? This brush offers up to 5 different cleaning modes. There are Clean, White+, Deep Clean+, Gum Health and Tongue Care. The 9300 Series does not have the TongueCare mode. The brush heads and numer supplied varies depending on which of the 3 models you chose. Please refer to the ‘variants’ section of the review for more information. All models come with at least 1 x C3 Premium Plaque Control, 1 x G3 Premium Gum Care, and 1 x W3 Premium White brush head. Any other Sonicare brush heads can be used on the brush, BUT the brush head detection will not function as the heads supplied with the DiamondClean Smart have specially built in chips to allow this to work. Sonicare compatible heads include, DiamondClean, ProResults, ProResults Gum Health, Sensitive and InterCare. Does the Sonicare DiamondClean have a pressure sensor? Does the Sonicare DiamondClean Smart have Bluetooth? Does the Sonicare DiamondClean Smart come with a warranty & how long is it? Yes, it does. The warranty is 2 years. Does the DiamondClean Smart have a built in timer? Yes. At the end of a 2 minute cycle, the brush automatically turns off signalling the end of the cleaning time. If you want to extend your clean, you will have to power the brush back on. It does also have a 30 second pacer also referred to as a quadpacer. At 30 second intervals a slight pause in the brushing mode to tell you to change quadrants. There are 4 quadrants to the mouth. The battery lasts up to 100 minutes, which is equivalent to over 3 weeks or 25 days of usage based on 2 x 2 minute cleans per day. Yes, a charging station is included with the toothbrush along with a travel case which can also charge the brush. Can I use the Sonicare DiamondClean Smart in the shower? No, the manual specifically states not to use the DiamondClean in the shower or bath. Yes. The DiamondClean Smart comes with a hard travel case that holds the brush and up to 2 brush heads. With the 9500 and 9700 the brush can be charged in the case via a USB cable. How to change Sonicare DiamondClean Smart toothbrush cleaning mode? The Philips Sonicare DiamondClean Smart is equipped with a second mode selector button. Your Philips Sonicare DiamondClean Smart will store your preferences for the next brushing session. How to disable the Philips Sonicare DiamondClean Smart brush head reminders? What is brush head mode pairing? A microchip in your brush head tells your DiamondClean Smart which one you’re using. So if you click on a gum-care brush head, for example, your toothbrush knows to select the optimal mode and intensity for that brush head. All you need to do is to press the power button. All Philips Sonicare electric toothbrush brush heads that snap on will fit your DiamondClean Smart toothbrush. However, not all can be used for Smart mode pairing. For smart mode pairing you need only those with the smart brush head icon (looks like a wifi signal) at the base of the brush head. A microchip in the Philips Sonicare Smart brush head tells your DiamondClean Smart which one you’re using. So if you click on a gum-care brush head, for example, your toothbrush knows to select the optimal mode and intensity for that brush head. The brush can store up to about 28 brushing sessions of data..
To avoid losing any data, download the Philips Sonicare app and sync your handle by connecting your toothbrush to the app. You will see that your data will be automatically uploaded to your progress report and the activity-tracking feature. Place the handle, with a brush head attached, in the plugged-in charger. Pressure sensor is enabled by holding the mode/intensity button and by pressing the power button twice while on a charger. The handle will beep twice to confirm it is enabled. The pressure sensor is disabled by holding the mode/intensity button and by pressing the power button twice while on a charger. The handle will beep once to confirm it is disabled. Place the handle in the plugged-in charger. Easy-start is enabled by holding the mode/intensity button and by pressing the power button once while on the charger. The handle will beep twice to confirm it is enabled. Easy start is disabled by holding the mode/intensity button and by pressing the power button once while on the charger. The handle will beep once to confirm it is disabled. Do you own or have you used the Philips Sonicare DiamondClean Smart? Really appreciate the review. Just bought a 9700 and it is nice. However, the tracking doesn’t seem to work. It never shows cleaning the inside of my teeth (tongue side) and misses other areas randomly. Does it “learn” as you use it or are there certain tips to increase accuracy? Whilst the app/software will learn your brushing habits, it should out of the box be pretty accurate at picking up the location of the brush in the mouth, based on the way you would typically hold and position it. The first thing to do is to go to the app store and check it up to date. There might be a software update available that may improve this. From within the app, under the My Products menu, you can also check that your brush is up to date, by selecting the handle update option. You may want to run a test where you try brushing just the insides of your teeth (tongue side). Maybe play around with the angle and position of the brush and see what the app picks up. If that doesn’t fix it, I suggest giving Sonicare a call. Thanks a ton Jon. These amazing review has made my life easier by helping me make an informed decision. Your reviews are elaborate, comprehensive and easy to read. Keep up the fantastic work.